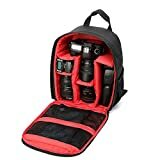 This camera rucksack is made from high quality polyster, it comes with multiple inner compartments for different digital camera components. This digital camera backpack has reinforced and shock-absorbing closed-cell padding. A perfect combination of photo gear, it is designed specifically for photographers. This entry was posted in Discount Photography and tagged Backpack, Camera, Canon, Case, DSLR, Nikon, Olympus, Rucksack, Sine90®, Sony by Ball Photo. Bookmark the permalink.